The Last Dog Rescue operates solely by donations, is a registered 510c3 non profit charity and all donations are tax deductible . We have no paid employees which means 100% of your donation will go to the dogs currently in our care or dogs we rescue in the future. Please donate and help save a life. 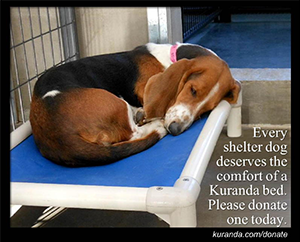 Click on the icon to donate a bed to our dogs! Donating just got more convenient with iGive. Click on the icon to start your on-line shopping and The Last Dog Rescue receives a percentage. There are thousands of participating merchants to choose from. Have fun and help save a life at the same time!